White Frosted Filter, 32mm Diameter. For microscopes or optical diffusion. Green Clear Filter 32mm Dia. 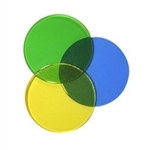 Translucent 32mm Diameter Green Filter. Yellow Clear Filter 32mm Dia. 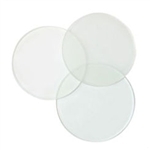 32mm Diameter glass yellow filter, clear. Useful for filtered microscope lighting or for optical experiments. 32mm diameter glass clear blue filter. Useful for filtered microscope lighting or optics experiments.